When actor and director Angelina Jolie first shared her story in The New York Times about life with the inherited gene mutation, BRCA1, she prompted many people to sit up and ask, "What the heck is BRCA?" The BRCA acronym comes from "BReast CAncer." Inherited mutations in two genes, BRCA1 and BRCA2, are most commonly associated with hereditary breast and ovarian cancer. However, while mutations in these genes significantly increase risk for the cancers in women, they increase risk of prostate cancer in men, and melanoma and pancreatic cancer in both men and women. In her "Opinion" piece, Jolie confided that she decided to undergo a preventive double mastectomy, a riveting admission from someone so famous — and seemingly living a perfect life. Her intensely honest communication on May 14, 2013 said that: "I choose not to keep my story private because there are many women who do not know that they might be living under the shadow of cancer. It is my hope that they, too, will be able to get gene tested, and that if they have a high risk, they, too, will know that they have strong options." Two years later, she was back in the Times, revealing she had undergone surgery to remove her fallopian tubes and ovaries. "Three women in my family have died from cancer," she wrote, one of them, her mother. "Jolie has been a blessing, and her stature as a celebrity speaking about this topic of gene mutations did more in one day with an op-ed than we could do in 10 years to raise awareness of heredity breast, ovarian, and related cancers," says Karen Kramer, senior vice president of marketing for FORCE: Facing Our Risk of Cancer Empowered, who spoke to HealthCentral in a telephone interview. People with relatives who have tested positive for a gene mutation. People from families with rare or young-onset cancers or multiple cases of cancer. People who are Jewish or have Jewish ancestry. "Our mission is to ensure that no one travels their hereditary cancer journey alone," she says. 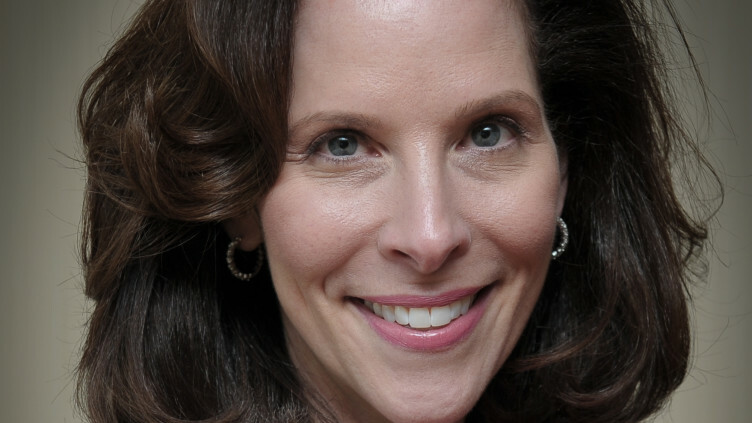 Kramer ought to know — she inherited a BRCA mutation from her father — yes, from a male. Now 53, Kramer was 43 when she did genetic testing. After she received news of the inherited mutation, she did her research and decided that a preventive double mastectomy with reconstruction, and then the removal of her ovaries, was the best choice for her. FORCE encourages people to learn all that they can and make medical decisions that are most appropriate for them, she says. Later, however, one powerful realization struck her: "I cried when I thought that each of my three children has a 50 percent chance of inheriting the mutation." She's encouraged them to be vigilant and proactive, and they are. Kramer notes that guidelines recommend that BRCA mutation carriers discuss risk-reducing mastectomy with their health care providers, and that women consider risk-reducing removal of ovaries and fallopian tubes between age 35 and 40 and upon completion of childbearing. Karen Kramer, senior vice president of marketing for FORCE. Knowledge is power. "Unless you know that hereditary cancer runs in the family, you don't know there's something you can do about it," Kramer says. "There are options. You can select to have risk-reducing surgeries or work closely with your health care providers to create a strong surveillance program." Some people don't want to know, she says. "It's an individual decision, and no one is judging anybody because of that. But when you have a genetic mutation, it means siblings, cousins, aunts, and children may have it, too. The 'ripple effect' among family members is huge, so when one person learns and they share, think how many people may be saved." She wants to thank Jolie, not just because of the millions who read the two op-eds, but also because of those they talked to who may have been motivated to seek genetic counseling. "Maybe they called their mom or dad or sister," she says. Alan with singer/songwriter and producer Kara DioGuardi, the star of his documentary on breast cancer gene mutations. The beloved sister of Los Angeles-based director and producer Alan Blassberg, Sammy Blassberg was diagnosed with breast cancer on Valentine's Day in 2008 and died Feb. 24, 2011 — she'd tested positive for the BRCA2 gene in 2010. His grandmother and aunt also died of cancer, and another sister, Lisa Brandes, who tested positive for the BRCA2 mutation, underwent a double mastectomy. 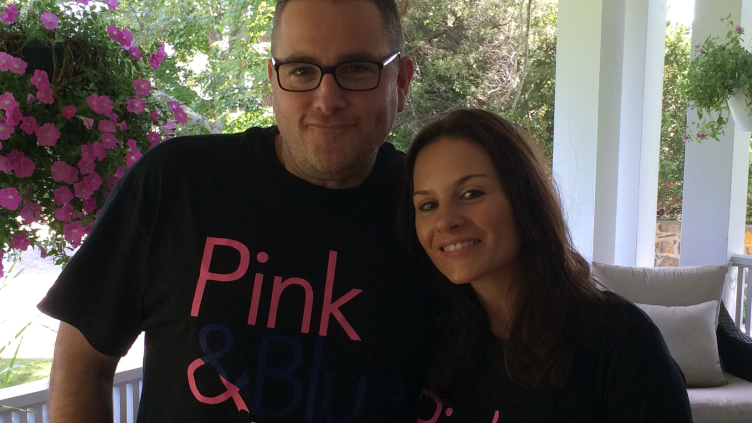 Blassberg's documentary, "Pink and Blue: Colors of Heredity Cancer," debuted in 2015, starring singer/songwriter and producer Kara DioGuardi. He says that although Jolie's "coming out" started conversations, many got blurred with inaccuracies and muddled facts. He especially wanted to convey that breast cancer isn't just a female disease, and that "male breast cancer patients endure some of the most ridiculous and uncomfortable situations." Keenly aware of his risk, and of the oddness of dealing with it, the reality show producer got tested in 2012 and was told — no surprise — that he, too, had inherited his family’s BRCA2 mutation. "I didn't know what to do, and was a little lost," he says. His fiancée, Stephanie Swartz, a five-time cancer survivor with no mutation, proved to be a rock-solid resource for him. He decided to undergo examinations for melanoma skin cancer and colon cancer. Then there was that breast cancer thing. Alan and his sisters tested positive for the BRCA2 gene mutation. 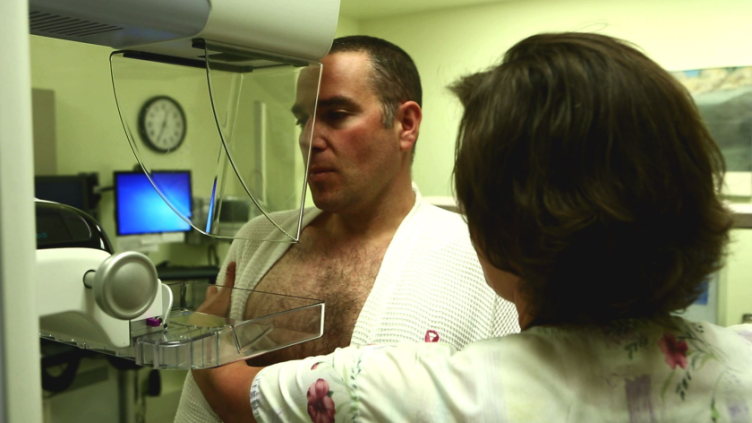 Here, he undergoes a mammogram as part of his careful monitoring and cancer surveillance. He went for an exam — make that a mammogram — an event he won't soon forget. "After calling me to the desk as 'Mrs. Blassberg,' I was given forms to fill out that asked about the date of my last pregnancy and whether I had vaginal dryness. I could feel anxiety coming up, especially when they brought me in the most roundabout, private way to the exam room." His tests were all clear, but he knows he's not permanently in the clear. He sticks to a disciplined schedule for all his exams — including the "mammo." "As important as it is, you don't realize how intense or painful that exam can sometimes be," he says. "Maintenance is key now and I keep an eye on everything." Blassberg's film played "from Iceland to Arkansas," he says, and qualified for two Academy Award categories. It's on iTunes now, available for preview, purchase, and download. "So many things opened up thanks to the film," he says. "It felt easier, like the universe was doing all the heavy lifting. I didn't want it to be a cry-fest, but a straight look at the effect this gene has on men — and on all people with this gene mutation." Former KISS drummer Peter Criss and actor Richard Roundtree are two notables who survived breast cancer. There are likely more, because some men choose not to be so forthright about "telling all." Blassberg is not one of them, and he's also not done yet with trying to straighten out the confusion around BRCA gene discussions. A yet-untitled sequel to his first film is currently in pre-production and starts shooting in July. It's scheduled for a 2019 release.